Carlos A. Cruz Velázquez in auto/PHOBIA. Photo by Scott Draft. BOTTOM LINE: An unconventional dance piece in which four performers move through a complicated, hyper-feminine world; it will leave you mesmerized and Googling things like "flamingos abandonment" to try to make sense of it all. auto/PHOBIA is an experimental performance piece by Carlos A. Cruz Velázquez, who also works under the name “colectivodoszeta." 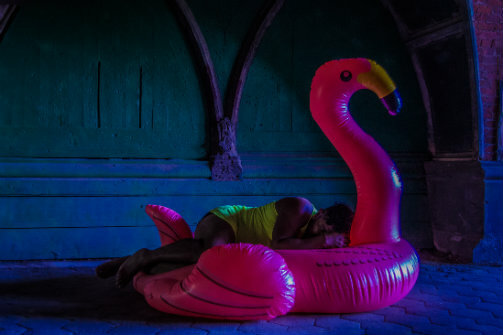 In the show, a man (Cruz Velázquez), three women (Jessica Galucci, Jennifer Jones, and ChristinaNoel Reaves), and various flamingo-shaped props (not credited) come together and apart. Though advertised as being about “loneliness and the fear of abandonment,” the performance is a highly abstract experience, and these themes are only hinted at in the production itself. Falling somewhere between performance art and avant-garde dance, the show is non-narrative and is most definitely not a play—there is no dialogue and there are no true characters. Instead, the work is primarily movement-based, and utilizes a recorded soundscape designed by Giovanni Escalera, along with occasional touches of live sound. auto/PHOBIA is innovative, but ultimately feels unfinished. The most compelling aspect of the piece is the tension between its kitschy props and costumes and its sincere, often understated movement and sound. Together, these elements create a unique aesthetic landscape that is at once fertile and spare. The show might have been stronger had Cruz Velázquez chosen to further heighten and explore this tension. Though the world of the performance is rich, its individual components vary in quality. Escalera’s sound composition is complex and creepy. The assorted flamingos, complemented by flouncy dresses and colorful toy guns, are delightful. Unfortunately, the movement, which is the core of the piece, is not quite as strong. The choreography is solid overall, with some traditional modern dance sequences and some inventive moments, such as when one of the female performers stands, flamingo-like, on one leg for so long that she begins to lose her balance. However, it’s a shame that the show consists almost entirely of duets and solos: to have two or three out of four dancers simply sitting and watching most of the time feels wasteful. Along the same lines, the choreography does not make optimal use of the space. There are multiple sections that are cut off from the view of significant portions of the audience. Additionally, the movement would be more captivating if the dancers were technically stronger. On the whole, however, the piece stands out as a valuable visual and symbolic experience, reminiscent of an offbeat art installation. auto/PHOBIA most misses the mark with its lack of major stakes. It does not have any kind of arc, and as a result it does not quite cohere or communicate its meaning. With some imagination on the part of the viewer, it is possible to impose storylines of abandonment onto each duet, but the associations are loose. Moreover, these interactions between performers don’t build. There are many interesting moments, such as a sensual use of water guns, and a woman getting thrown into a flamingo-shaped inner tube after having an operatic emotional breakdown. But these moments don’t revolve around a center, and therefore don't pay off. The show's ending is not a direct consequence of all that has happened up to that point, and thus packs little punch. Regrettably, in casting off the shackles of traditional narrative structure, the piece also disregards its obligation to have an internal logic. Aside from its flirtations with loneliness, the performance’s main concerns appear to be gender and sexuality. The campy costumes and props combine with balletic, tender qualities in the movement and sound to create a lush paean to femininity—which the main performer’s maleness and the flamingos’ status as symbols of queerness then complicate. It is in relationship to these matters that auto/PHOBIA comes nearest to true engagement with the idea of abandonment. The performers are perhaps mourning the loss of something more specific than just companionship: mommy, daddy, masculinity, heterosexuality? It's not quite clear, but there is something intriguing there. That said, the show’s preoccupation with femininity is also cringe-worthy due to the way that actual women are used to embody the concept. The male lead unironically uses interchangeably presented women as literal and figurative props; it is one thing to toy with gender and another to use women as toys. For the academically oriented, this production is sure to bring to mind some of the current debates within and between queer and feminist theory. The theatergoer new to or unsure about experimental performance will likely find themselves thoroughly confused and disappointed by this show. However, it is a must-see for anyone with a visual bent who is more interested in experiencing something fresh, if rough around the edges, than something tried-and-true. auto/PHOBIA exemplifies what is best about the Fringe: its status as a playground in which artists have the opportunity to take real formal risks. auto/PHOBIA is choreographed, directed, and designed by Carlos A. Cruz Velázquez. Score by Giovanni Escalera. Lighting Design by Natalie Robin. Stage Manager is Gabrielle Weinstein. The cast is Carlos A. Cruz Velázquez, Jennifer Jones, Jessica Galucci, and ChristinaNoel Reaves.